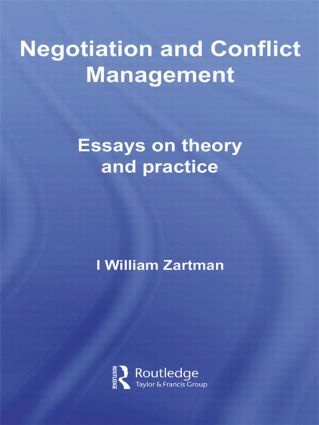 This book presents a series of essays by I. William Zartman outlining the evolution of the key concepts required for the study of negotiation and conflict management, such as formula, ripeness, pre-negotiation, mediation, power, process, intractability, escalation, and order. Responding to a lack of useful conceptualization for the analysis of international negotiation, Zartman has developed an analytical framework and specific concepts that can serve as a basis for both study and practice. Negotiation is analyzed as a process, and is linked to other major themes in political science such as decision, structure, justice and order. This analysis is then applied to negotiations to manage particular types of conflicts and cooperation, including ethnic conflicts, civil wars and regime-building. It also develops typologies and strategies of mediation, dealing with such aspects as leverage, bias, interest, and roles. Written by the leading exponent of negotiation and mediation, Negotiation and Conflict Management will be of great interest to all students of negotiation, mediation and conflict studies in general. Negotiating with terrorists: When, how and why?